Relay interface module with 16 relay control voltage 24 VDC 250VAC/8A DPDT 2NO +2 NC Relay interface module RSM16RS 24 VDC SAFETY 24 VDC output 250VAC/8A DPDT 2NO+2NC. Special Electromagnetic Relay - trigger type with 2 coils, 110 VAC, 250 VAC, 3 A, 3PDT - 3NO +3 NC Special electromagnetic relay - type trigger with 2 coils with voltage 110 VAC.Rated voltage- 250 VAC, rated current 3 A. Universal Electromechanical Relay coil 12 VDC, 240 VAC, 16 A, DPDT - 2NO +2 NC MM2F Universal electromagnetic relay MM2F with rated voltage coil 12 VDC,rated voltage 240 VAC and rated current 16 A.
Electromagnetic power relay JQX-62F coil 220VAC, 100A, 250VAC SPDT NO + NC Power electromagnetic relay JQX-62F coil 220VAC, 100A, 250VAC SPDT NO + NC. 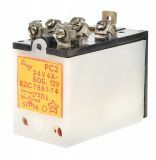 Electromagnetic relay 24VDC, 70A, FRC3A-DC24 Electromagnetic relay 24VDC 70A. Electromechanical Relay coil 24VAC 3PDT - 3NO +3 NC 250VAC/10A RP92 Electromagnetic relay coil 24VAC 3PDT - 3NO +3 NC 250VAC/10A RP92. Electromechanical Relay coil 24VAC, 4PDT 4NO +4 NC, 250VAC/10A RP92 Universal Electromagnetic Relay coil 24VAC, 4PDT 4NO +4 NC, 250VAC/10A RP92. List Price: 6.50лв. VAT Incl. Relay coil 12VDC, NO, 24VDC, 4pins Relay coil 12VDC, NO, 24VDC, 4pins. Relay 24VDC, 220VAC/10A, 3NO, 8pins Relay 24VDC, 220VAC/10A, 3NO, 8pins. Electromagnetic relays - power 12VDC 220VAC/25A SPST-NO G7L Electromagnetic relays, power 12 VDC 220 VAC / 25 A SPST-NO G7L. Electromechanical Relay universal 12V, 24VDC 4A, SPDT-NO + NC Universal electromagnetic relay 12V, 24VDC 4A, SPDT-NO + NC. Electromagnetic relays - power 240VAC 220VAC/25A SPST-NO G7L Electromagnetic relays - power 240VAC 220VAC/25A SPST-NO G7L. List Price 7.90лв. VAT Incl. 7.50лв. VAT Incl. 7.11лв. VAT Incl. 6.70лв. VAT Incl. 6.32лв. VAT Incl.